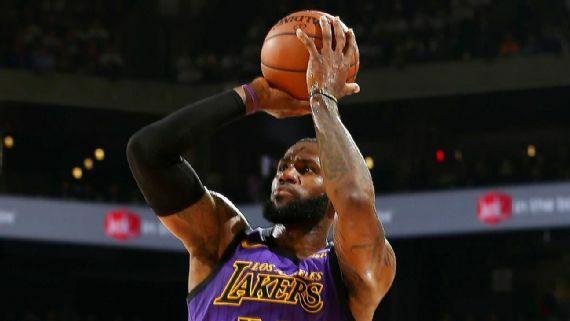 EL SEGUNDO, Calif. -- Los Angeles Lakers forward LeBron James, still recovering from a significant groin strain that has kept him sidelined for three games, participated little in practice Tuesday but did get some shots up in front of coach Luke Walton for the first time since his injury. James is still listed as day-to-day, and it remains unclear how long he will be sidelined. Sources previously told ESPN's Brian Windhorst and Adrian Wojnarowski that the team was preparing for James to miss several games after he suffered the injury on Christmas against the Golden State Warriors. Walton said Tuesday marked "the first time I've seen [James] shooting," but, Walton added, "He's working on his body, his game, himself all the time. But that's the first time I've seen him shoot [since the injury]." The Lakers beat the Sacramento Kings on Sunday, snapping a two-game skid with James sidelined. James' teams had lost 13 straight games when he wasn't in the lineup, dating to March 16, 2016, when the Cleveland Cavaliers beat the Dallas Mavericks. "It's definitely tough because he's very vocal," Lakers swingman Lance Stephenson said. "With him missing, it's like everyone is quiet. You don't know what's going on on the floor. But as the games that we had, I think we got better at it." On Wednesday, the Lakers will face the Oklahoma City Thunder for the first time this season -- a game with added intrigue, as it will mark the Lakers' first game against Paul George, who turned them down in free agency and instead signed with the Thunder. Walton didn't say much when asked about George's decision. "It doesn't matter," Walton said. "You prep yourself, you do your work and then whatever's gonna happen is gonna happen. You don't get too emotionally attached to it. We went after players, LeBron decided to come, Paul didn't. That's our team now. We're very happy we have LeBron James on our team." Stephenson played with George with the Indiana Pacers and also was mum when asked about his former teammate. "He's where he's at," Stephenson said. "We talk. We friends. On holidays we talk, keep in touch, we play in video games together sometimes. But for the most part, yeah, that's my boy."